While at the Petersen for their most recent Breakfast Cruise-In, we stopped in to see their new art wall exhibit that traces the history of license plates. It’s no secret that hot rodders and classic car enthusiasts alike have a fascination with license plates, which we delved into during this post from last year. We were anxious to discover the historical gems that the Petersen had to offer, and today we’re bringing you a few highlights from our visit to this exhibit. We’ve all played the license plate game on many a long drive, but there’s something about seeing these plates together in one place that takes our fascination to a whole new level. As always, the Petersen does a wonderful job of taking us back in time in this exhibit to teach us how the license plate came to be. “In keeping with the Constitutional precepts limiting the power and scope of the federal government, the licensing of motor vehicles has been left to each individual state. 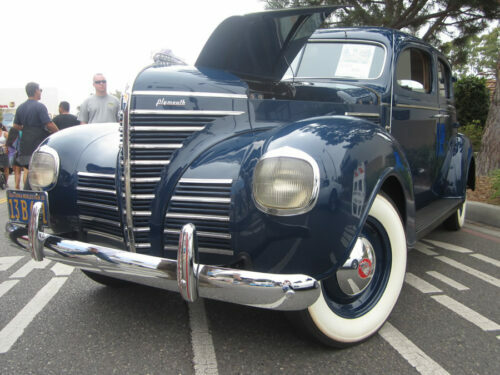 … complete with a World’s Fair plate detail of its own. It was fascinating to see the special plates that are rarely seen on the road. “The federal government also issues plates, but only for its own official vehicles and for those owned by foreign diplomats. These State Government VIP plates almost didn’t look real, but they are and serve a special purpose. “Single digit numbers on California license plates are normally reserved for high ranking state government officials. The governor is issued plate number ‘1’, the lieutenant governor is issued plate number ‘2’, and other officials are issued plates with correspondingly higher numbers depending on their rank. 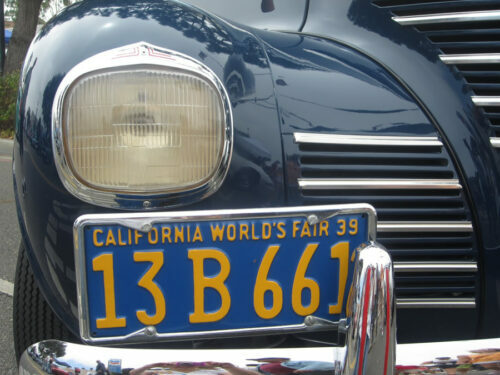 Their distinctiveness and rarity make them among the most highly prized artifacts among California license plate collectors, especially the governor’s plate from 1932, which is desirable because of the popularity of the 1932 Ford and because the 1932 Olympic Games was opened with the governor riding in the car that carried the plate. Many state-issued plates include slogans or graphic depictions of objects important to the statewide history or economy. There were so many more plates on display (including this wall of international plates), and the research provided on them answered many questions we had about how and why plates have changed throughout the years. This exhibit will be on display through March 30th, so be sure to stop by the Petersen to see the all of the rare and unusual examples in this interesting collection!